Shutters enhance the beauty of your home and have been a tradition for hundreds of years all around the world. Shutters are used to enhance your home decor as well as provide protection from the outdoor elements. 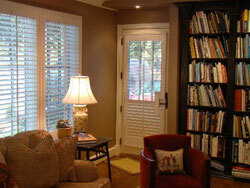 At J & W Custom Installations, we will assist you will the exact shutters to meet your needs. We can work within your budget and we always provide free estimates. We work with all manufactures to provide you with affordable window shutters for your home, office, RV or motorhome. We are not limited to modular sizes - we provide custom made shutters that are specifically made for each individual window opening.